Below are examples of the documentation and practices with varying age groups. Since September, I've been working with a group of nine infants and toddlers through the Cambridge Even Start program. I, along with two other teachers, care for the children in a classroom space at the Peabody School while their mothers are attending English class next door. As children have phased into the group throughout the year, I've been fascinated by each child's process of separating from their mothers (many for the first time) and of becoming part of the group. I first began to document this process with Harold, a 16-month-old who, outside of brief intervals of being cared for by his father, had never been without his mother. Through taking notes and photographs, I began to notice the role of the other children in helping Harold overcome the hurdle of functioning when apart from his mother. Since then, I've tried to document segments of the process for other children as they've joined our group. For some the transition has seemed smooth, while for others the journey has been painful. In each case, however, the group has played an important role. I've included below, pieces of the process for two of the children. I hope to add stories of two recent members later. 1. How do the toddlers in my group help one another to integrate into the group? 2. How do they support one another in successfully separating from their mothers? To see the documentation from this example, download the PDF under resource links. Two first and fourth grade teachers bring their students together across schools and grades to engage in a Freedom Curriculum they created based on the Civil Rights Movement. This panel shows the work and words of students and teachers over six years of their study of the Sit-In Movement, and how the study has evolved because of what the teachers learn about and from their students through documentation. What seeds did we plant? How did we care for them? This World Literature I class is a ninth grade "College Preparatory" level class, as opposed to an "Honors" level class. In general, the students are bright and interesting, but don't see themselves as being particularly smart or successful in school. For many of them, the lack of motivation to do work outside of class is a major impediment. The material presented here is taken from the final five weeks of a semester long course. The inquiry questions, though, come mainly from the final two weeks of class when some things, notably the literary analysis of Lord of the Flies, turned out particularly well. In an attempt to unravel the components of this success, I have begun to sift through student comments and reflections as well as my own gut feelings and the observations of my partner, Joan, for clues. 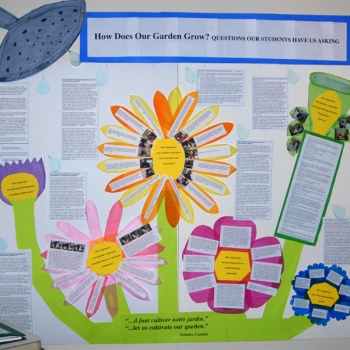 There's real evidence of flowering in the work of Jen's grade nine English Language Arts students. We are wondering how - and the degree to which - we made that flowering happen, especially because in the future, we'd love to grow other gardens filled with even more robust, variegated, and beautiful flowers. Thus, we* are trying to figure out what conditions and moves on Jen's part made it work, and how they were effectively balanced for these ninth-graders. In an important way, Jen and I are at "sixes and sevens": our* students' reflections and work, done in association with a unit focused around seven understanding goals, has given rise to six inquiry questions for us. *My comments will often use the words "we" and "our." Please understand that the students represented here are most definitely Jen's. But since Jen and I plan, document, assess, and reflect, I consider them to be my students also from the MLV perspective, hence the words "we" and "our."